Life is composed of a series of changes, and we either accept and adapt or fight against time. One day, your pet is flying through the air in pursuit of a favored Frisbee; the next, he or she inexplicably refuses to get off the couch for a meal. 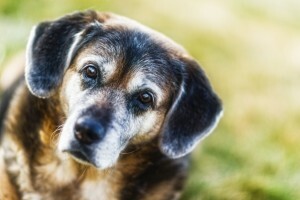 Embracing this type of change can be very difficult, but through an understanding of basic senior pet care, you can fortify your aging pet’s overall wellness to ensure maximum safety and comfort. A pet is considered to be senior around 7-8 years of age. When paired with quality veterinary care, active owner participation can greatly affect a pet’s lifespan. At this stage in your pet’s life, we usually recommend bringing your pet in twice a year for wellness examinations. Doing so allows us greater access and insight into any developing health issues that are common among senior pets. Common age-related conditions include periodontal disease, cancer, diabetes, arthritis, and kidney disease. Through a variety of diagnostic tests that we run in our advanced lab, we can identify and treat diseases that may shorten a pet’s lifespan if left undetected. Please do not delay – if your pet displays signs of an illness or injury, every passing moment is critical to his or her full recovery. Once nutrition, dental care, exercise, and any pertinent lab results are addressed, we make sure your aging pet remains comfortable. Sleeping tends to increase during the senior years, and providing a soft, warm place for your pet to snooze goes a long way toward soothing achy joints. Likewise, regulating body heat becomes a challenge, and exposing your senior pet to hot or cold temperatures can have serious consequences. We’re privileged to offer your pet a variety of services that support the process of aging, and we’re happy to answer your questions regarding laser therapy or our in-house pharmacy. Many owners of senior pets have questions about end of life care, and we’re committed to giving you compassionate choices. Losing a pet is heartbreaking, and we hope you’ll take the opportunity to peruse our pet loss library, create a special pet memorial, and light a candle for your beloved pet. You are not alone; we can assist you in finding the help you need. At Volunteer Veterinary Hospital, your partners in senior pet care are always here for you, and we hope you’ll call us with any questions or concerns.